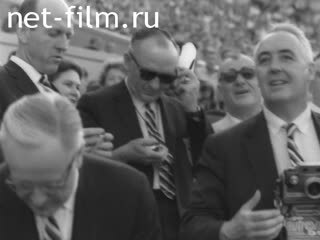 Operators: Artseulov O., Aslanov G., Kokoshvili L., Leongardt U., Mikosha V., Mukhin E., Oshurkov M.
Film about the match between the athletics team of the USSR and the USA in Moscow at the Central Lenin Stadium. Press conference athletes D. Thomas, R. Boston (USA), V. Brumel (USSR) (synchronously). Among those present: F. Davenport, M. McCarthy, B. White, D. Elliott, B. Richards (USA), D. Ozolina, T. Press, B. Krepkina, G. Korobkov, V. Diachkov, V. Kreer ( USA). Parade participants. Spectators in the stands. Race for men and women at different distances. Men's long jump and height. Hurdling. Discus throw, javelin, nucleus. Award winners. Among the athletes, referees, coaches: A. Mikhailov, V. Rudolph, M. Itkina, AF Budd, D. Elliott, R. Backus, T. Pegani, Yu Bakarinov, Rudenko, K. Flerko, U. Sharp, A. Fedoseev, V. Kreer, B. White, V. Krepkina, Don Ferris, G. Korobkov, H. Jones, T. Press, J. Press, B. Richards, B. Hoffmann, G. Gubner, B. Sot, Y. Zakharov, L. Virkus, N. Kitt, V. Kuznetsov, V. Tsybulenko, T. Shchelkanova, P. Boston, I. Ter-Hovhannisyan, E. Batson, R. Shavkaladze, V. Brumel, P. Bolotnikov, D. Thomas. Among the audience members of the family B. Brumel, his wife and son P. Bolotnikov. Lenin - LS. (With a / t, no people). Journalists met with the participants of the match athletes USSR - USA in the Conference Hall Stadium. John Thomas (USA) Ralph Boston (USA), Valery Brumel at a press conference. Playing V. Brumel, D. Thomas (synchronously). American fron Davenport talks to Olympic champion Elvira Ozolin the stadium. Tamara Press interview with Melody McCarthy (USA) on the theory of the shot put. Masters triple jump Witold Kreyer (USSR) and the American Flerki dismantled theory jump. At the stadium, talking Krepkina Vera and Willie White (USA). Train at the stadium stayers USSR and the USA. Americans talking animatedly coach James Elliott and head coach of the Soviet team Gabriel Korobkov. Soviet jumpers talking coach Vladimir Dyachkov American television reporter and Bob Richards. Viewers go to the stadium. The stands filled with spectators - LS. The field consists of the contestants. The queue at the ticket office stadium. Spectators in the stands applause greeted the competitors. Team USA athletes of the Soviet Union and at the stadium. Soviet and foreign journalists and photographers at the stadium. Representatives of the American and French TV in the stadium. Cameraman is the transfer of the stadium. The judges take their places. Judge A. Mikhailov - CU. Wilma Rudolph (USA) is directed to the start. At the start of the Wilma Rudolph and Maria Itkin. The starter gives the command. Race Women 100m - PNRM. (With a / t). Getting ready for the start of the men. Running man at 100 meters, runners participate Protorovsky Glory, Vladimir Vinogradov, Americans Frank Budd and Paul Drenten; Americans win: I place - Budd, II place - Drenton. Trainer D. Elliot smiles - CU. Playing hammer throwers - Americans Robert Backus, Tom Pegani, Soviet athletes Yuri Bakarinov and Basil Rudenko. Triple jump serve Americans Flerki Kent, William Shafa and Soviet divers Oleg Fedoseyev and Witold Kreyer (wins). Relay 4x100m women: the first phase running Krepkina Vera and Willie White. In the second phase running Ernie Pollards and Valentine Maslovskaya. In the third stage - Maria Itkin and Vivian Brown. In the last stage - Tatiana Shchelkanova and Wilma Rudolph. Corresponding test results in minutes. Coach USA Elliott and Don Ferris at the stadium. Men's 4x100m relay, the first run and Edwin Hayes Jones Ozolin, the second phase - Frank Budd and Leonid Bartenev in third - Yuri Konovalov and Charles Freyzher, the fourth - Paul Drayton and Nicholas policy (defeated Americans). Running men's 110 meters hurdles - run Frank Washington, Hayes Jones (USA), Anatoly Mikhailov and others (winning American). Tamara Press Leningradka throwing disc (a world record). Sister - Irina Press congratulates Tamara. Correspondent Bob Richards interviews Tamara Press. Judge moves to shield box with a picture of the world - a world record T. Press. Irina Press is preparing to run in the 80 m hurdles. Women's race is 80 meters hurdles - wins Irina Press - LS. (With a / t), CU. American pushes the nucleus - MS.
Nucleus pushes Tamara Press (I took place). Press TV on the podium. Tamara Press handed a gift from the fans of Leningrad - the core reading "Fall for 18 yards." Harry Gubner - American shot putter and coach Bob Hoffman American weightlifters at the stadium. G. Gubner pushes the nucleus (I place). In running, the Soviet athletes participate Valery Bulyshev and Vasily Savinkov. Running men's 1,000 m, leading Yury Zakharov and Lembit Virkus (USSR) - LS. Running men on the 10,000 m at the stadium in Philadelphia - run Pyarnakivi, Desyatchikov (USSR), Bob Acres, Truex (USA). Unsuccessful attempt to circumvent Desyatchikova Bob Sota. First finish in the women's 10,000 m in Moscow Soviet athlete Yuri Zakharov, the second - A. Virkus (USSR). At a distance of American Nicholas Kitt. First to finish Frank Budd, II place - Paul Drayton; III place - Edwin Ozolin; IV place - Thank Prokhorovsky. Judges find traces Drayton on the border track (violation runner). In the long jump Tatyana Shchelkanova (sets a world record). Judges check the length of the jump, wind direction and speed. Device of the wind - CU. T. Shchelkanova winner - CU. Willie White jumps in length (set the record for the U.S.). Jumpers Ralph Boston and Anthony Batson measure the length of the takeoff run. Long jump and Boston Ter-Hovhannisyan (both stand up for the bar and get 0). Jumping R. Boston (general shooting and rapid). Jumping Bean Event, Robert Shavlahadze. Native Valery Brumel the stadium. Mother - Lyudmila, a younger brother Igor, Oleg's brother - a student, sister Emma - engineer. His wife and son Peter Bolotnikov - Maria and Valera - on the podium. Running man at 5000 m: P. Bolotnikov the race, finish first. Jumps in height American Thomas (unsuccessfully). Thomas jumps for the second time (successfully). Thomas and jump Brumel (unsuccessfully). Coach of the box on the competition jumpers. Spectators, family, friends congratulate Brumel. On the podium are Wilma Rudolph and other American athletes. Brumel resting on the grass. Competitors pass through the stadium.